G’day guys, I have not ventured out very far since I pretty much got skunked but I have been able to sneak out in the dark of the morning and fish the rip at Waytoohardanuie. My confidence has now well and truly been smashed to bits as I did not touch a fish in two hours fishing the drop of with lumo wet flies. I was standing in the rip at 5 30am braving a solid -3 frost hoping that just maybe the odd one would be passing in and out of the rip but I was disappointed and left without a touch. For the next couple of days I will be working in Hamills in Taupo as I have been for the past couple of days and the maori boys that have been coming in buying lumos have been doing ok late at night . Fish seem to be coming in small groups for a short period of time with no real times being better than any other. 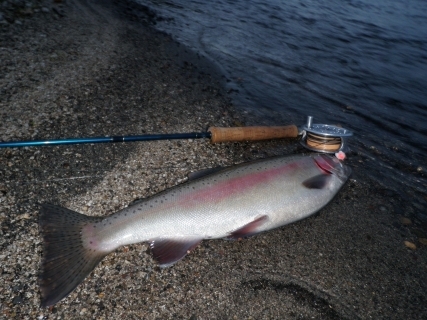 Fishing at the moment seems to be spasmodic wherever anglers seem to be trying and many go home with nothing (like me). The fish that have been coming out of the rips have been inÂ very good condition so this will hopefully be reflected in the rivers after this rain. The rain has been steady in Turangi today and if this can keep up throughout the night I think Thursday may be ok in some of Taupo rivers. If we get a peak in a river I think I will be hitting the TT as I have a feeling that this may fire first. They seem to be running through this river very quickly so being on the spot will be vital to success. As usual the locals will be onto this and getting to the river and fishing where you would like to be may be hard unless you get up nice and early and brave the frosts. I had two guys come in the shop today that had been fishing the first little stream around from the Kinlock beach and done quite well at 11am last night with lumo’s. The name of this river is quite easy to remember but I cant for the life of me right now. Fishing aÂ floating line from the shoreÂ is all that is needed here and in the summer this can be one of the best spots on the lake for smelting fish. I think they still smelt in the lake when they show themselves! 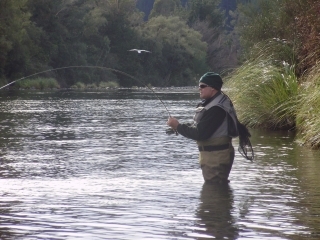 Photos today are of TK fishing the Major Jones on the weekend with a very elusive Tongariro trout which all seemed to elude us over the weekend. I have had a few emails from anglers confirming the difficult fishing conditions which is comforting to know you are all struggling as well.Â Â Hold tight people the tide is changing and we will be into silver bullets in no time. 14/7/09Â Â Hi guys, Went down the rip again at 6am this morning only to be greeted with a slightly too strong wind from the west for me to stand in so sat in the car and weighed options for ten minutes as I was up and did not have to be anywhere for couple of hours. Toughen up was the call so I marched out and swung the shooting head and Lumo into the confuse rip for an hour for nothing. At seven am I put on a dirty heave and leave and enjoyed instant success finally breaking my dry spell with this beauty jack. This fish pulled like a train and was hard to pull from the rip but eventually I got the better of him. I did not catch another fish but spotted 1 or 2 in the straight as I walked back to the car so the rain may have moved a few through the night. 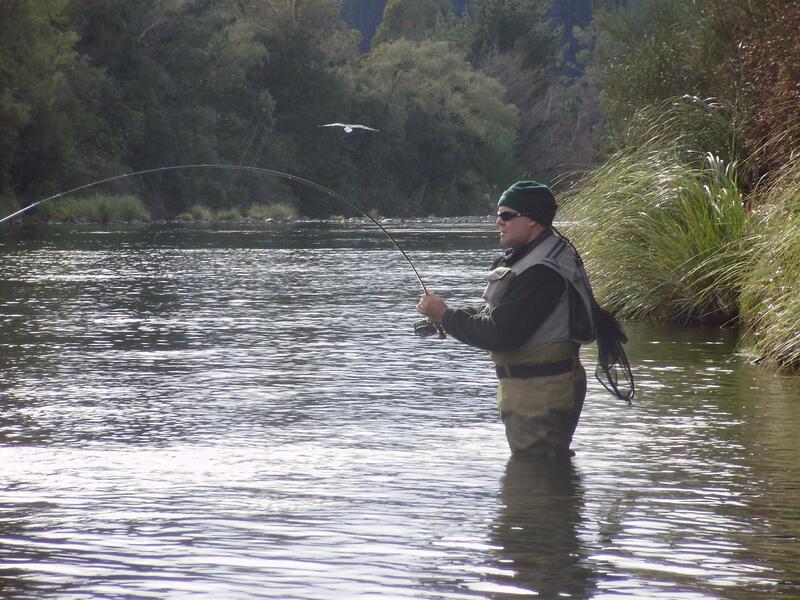 This monster brown is evidence of what anglers could have bneen catching this last summer in the lower Tongariro. There were hundreds of these buggers at this size down low but onlyÂ a few double figures could be fooled and pulled from secret logs and snags. This fish has suberbly been diplayed on one lucky mans wall and looks fantastic, well worth the money in my opinion. I will be heading out again in the morning as sleeping at the moment is not agreeing with me so I will do what I love the most instead, may see you there.